I've been neglecting the southbay on this hunt and although the southbay will never be accused of being taco central there are some gems to be found. Back when I started this taco hunt someone recommended the El Taco Loco #5 on Lomita blvd. Luck would have it I was heading west on Lomita when out of the corner of my eye I saw this taqueria. With some heavy transient activity outside the neighboring liquor store I slipped inside the taqueria and ordered a carne asada taco and al pastor taco. I was meeting some friends for dinner later in the evening and I didn't want to spoil my appetite but I also didn't want to pass up a taco opportunity. 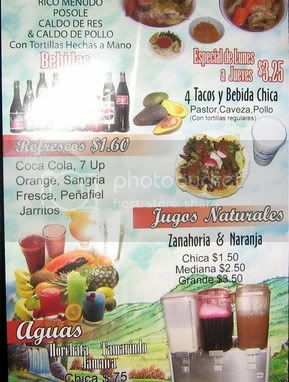 This is a great little taqueria with a very affordable menu.You can get three tacos rice and beans for $3.50(monday-thursday)otherwise tacos are $1.25 each.Another special is four tacos(pastor,cabezo,pollo) and a small drink for $3.25.There's not much going on at this stretch of Lomita Blvd and there aren't any offices nearby so it's probably tough to get the crowds in for lunch and the specials are a great way to do it. My tacos came wrapped in thin paper with a small plastic bag of jalapenos and marinated onions. The tortillas were hechas a mano(homemade)and the difference was noticable not only in the taste but the durability. 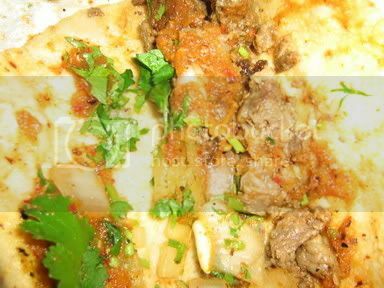 One tortilla per taco was able to hold the meats onions and salsa without collapsing. When looking at the menu it's unclear whether the taco specials come with homemade tortillas so that's something you should inquire about. I opened up the al pastor first . The charred bits of pork went well with the carmalized onions and smokey salsa roja. The juice from the pork and salsa soaked into the fresh corn tortilla and I was really pleased with the overall flavor of the taco. It met all the standards of what makes a great taco. As far as the asada the meat was tender but I wasn't gettting the same feeling I had just recieved from the al pastor. It could be that the al pastor was so good that the asada couldn't compete but there was something missing . A few bits of fat in the taco didn't help it's case either. But I will return to the southbay soon and undoubtedly remember El taco Loco when dining at other taco establishments in the area. I don't feel like I have my pulse on the southbay taco scene like I should so that's where I lean on you loyal reader. Send me your favorite southbay taco trucks and taquerias so I can broaden my taco resume and I will report back with my findings. The Great Bandini invades the South Bay ! 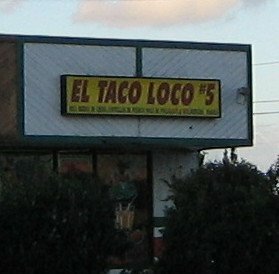 I'm glad you got a chance to try out El Taco Loco #5. I was the one who recommeded it on a previous post. Yes, the tortillas are handmade as I have witnessed this myself (Well, actually more like hand pressed but fresh none the less). The fresh tortillas are for the single $1.25 tacos. 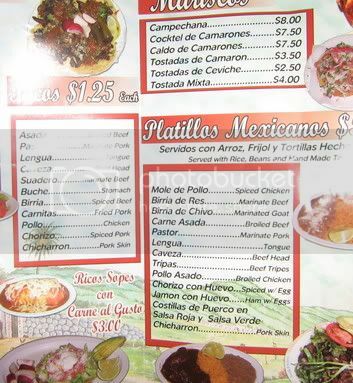 The tacos platos that are on special for $3.50 and $3.25 use pre-packaged tortillas. And yes, I agree the al pastor is the way to go here with not much to say about the asada. I would recommend the Suadero tacos next time as there is a bit more flavor there compared to the asada. On the weekends they have a cart they wheel out front with the al pastor spit. So you order inside and go back outside to get your tacos. 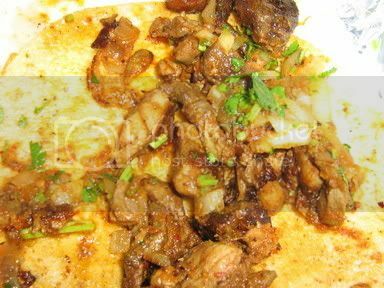 Besides tacos the other standouts on the menu are the Mole de Pollo and the Costillas de Puerco both served with handmade tortillas ($5.50). Lots of spicy heat in these 2 dishes that will make you come away sweating which is why a large Horchata is good to have on hand.($1.50). There are other locations in Torrance, Wilmington, and Long Beach but the menu varies slightly for each one. I wish I could say that there are more noteworthy places in the South Bay to recommend for review but I think El Taco Loco might be the pinacle for the area. You have to try El Nopal on Motor and National in Palms...best tacos I've had in this fair city...definitely worth checking out. thanks for the rec for this place.I'll have to check it on the weekend to see this cart they roll out. Sounds like El taco Loco is in control of the region as far as tacos go much like King Taco has the eastside. el nopal ..the home of the pregant burrito eh? I think I've had there hardshell tacos before. I still want to try the pregnant burrito though. 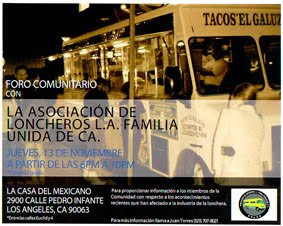 Where are the Locos in Torrance and LB? In LB I like El Taqueria #2's al pastor. It's on 4th St (@ Coronado [or Obispo?] near Redondo Ave.
Riviera's for huge, juicy, garlicky fish tacos at 7th and Gladys Ave.
Taco Loco in Long Beach is on Magnolia, north of Anaheim (the 1400 block or something, I think). In the South Bay, let us know what you think of Amigos Taco, corner of Hawthorne Bl and Rosecrans; there's another one on Gardena and IIRC at least two west of the I405. Across Rosecrans from Amigos is a way old style place - Poblanita Express - that has crispy, gringo style tacos with shredded beef, lettuce, yellow cheese, home made shells. I know not your style but give it a shot. Also in South Bay: in Redwood City, try the Tacos El Grullense that's at the corner of Middlefield and Charter. It's the only one I've been to, but apparently the others aren't as good. I've been there, though -- what I really want to know about is places in East Bay! As for South Bay in SoCal, I really like Amigos Tacos on PCH/Artesia...I haven't tried the other Amigos Tacos. Yes, El Gallito, the yellow taco truck near the intersection of PCH and Vermont is very good. Been going there for years despite rather heavy transient activity in the parking lot. Excellent Al Pastor and Carnitas. Good, smoky salsa roja. Be sure to ask for the Jalapenos and steamed onions. there is a taco loco in long beach on magnolia that is sooooo freakin good. Try the chorizo taco it s is to die for. El Taco-lgando is great you should try it.